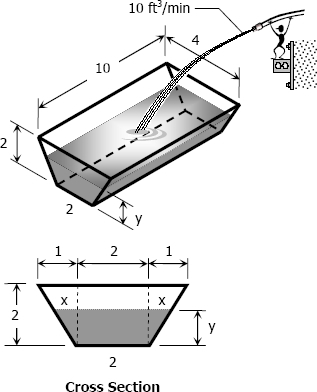 A trapezoidal trough is 10 ft long, 4 ft wide at the top, 2 ft wide at the bottom and 2 ft deep. If water flows in at 10 ft3/min, find how fast the surface is rising, when the water is 6 in deep. For the trough in Problem 13, how fast the water surface is rising when the water is 1 foot deep.